We all dream of a debt-free life, but most of us are not that fortunate. Maybe we enjoy our shopping sprees a little too much, and we’ve racked up quite a debt. If that’s the case, it’s time to get your finances into shape. Add up your total debt instalments for one month. Divide this figure by your monthly income and multiply by 100 to get your DTI. R2000/R6000 x 100 = 33 percent. If you approach a bank for a loan for something like a house, they will typically work out your personal DTI. This is because the DTI is seen as an indication of how able you are to repay your debt (bond) every month. 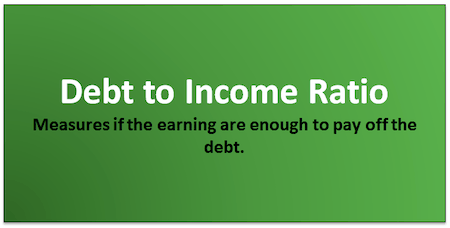 A low debt-to-income ratio shows a good balance between income and debt. Generally, the lower your DTI, the higher the likelihood that you will be able to secure a loan or get credit. Obviously, lenders want to lend money to those people most likely to pay back the money. That’s why they like a low DTI ratio. If, on the other hand, someone has a high DTI ratio, they might have too much debt compared with income, and consequently be unable to honour a further debt such as a bond on a property or a loan for a car. The average household debt-to-income ratio in South Africa from 1969 to 2017 was 57.58 percent. 2008 saw the highest ratio at 86.40 percent, while in 1980 a record low of 40.43 percent was recorded. These figures contrast quite drastically with those of other countries. For example, the percentage recorded in December 2016 was 126.42, while that for Canada in June 2018 was a whopping 171.31 percent. Obviously, a combination of the two can also work. For example, let us say your DTI ratio is, indeed, 33% as you pay out R2000 a month to service your debts and receive gross income of R6000 a month. If you were able to cut your monthly repayments to R1500, your DTI would reduce to 25%. That would be looked upon more favourably than 33%. If, on the other hand, your income is increased to R8000 a month, your new DTI ratio would again be reduced to 25%. But these are just figuring, and reducing your monthly debt or increasing your income are not so easy. One of the first things to do is to consider what you’re spending your money on. Are they really needed, or are they just things that you want. Needs are things we need to allow us to survive, such as food, water, shelter, health care, transport, and so forth. On the other hand, ‘wants’ are things that you might desire but aren’t essential for survival. That early morning muffin, for example. That’s a want, not a need. You could easily make a batch of muffins every week, freeze them, and take one to work with you every day. The savings you would make would add up quite nicely. The same goes for that daily pick-me-up coffee. If you’re paying out R25 or more, add up what that means you’re spending every month on takeaway coffee, and you might get quite a fright. You need to draw up a budget listing all your expenses and income. Prioritise paying off debt, especially accounts and bills that attract high-interest rates. Any little bit you can pay towards a high-interest debt will help reduce that debt until it’s off your plate.